With Revolve you carry the wheel places, crossing over easily between your trains, planes and automobiles. With a simple action, you open and close the wheel. He designed the wheel as foldable. He said it can be folded such that it occupies up to 60 percent less space. Two handles lock and unlock the wheel. Consider its implications too. Not only does the owner have more room in a modest sized apartment to accommodate a bicycle but bicycle stands could also have the advantage of added space. Also, as for wheelchair wheels, Brian Wang in Nextbigfuture commented that "Having lighter and stronger wheelchairs will be a huge benefit to the aging and disabled." 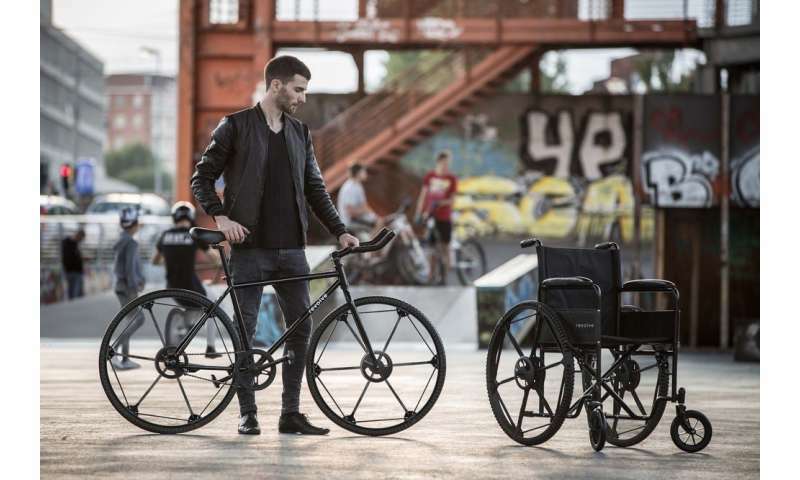 "The problem which Mocellin's wheel overcomes, is that folding bicycles until now have had to use smaller wheels to be able to fold to a small enough size for carrying – most folding bike manufacturers use 16- or 20-inch wheels. The Revolve can offer full size 26-inch wheels that fold to less than one third their height." 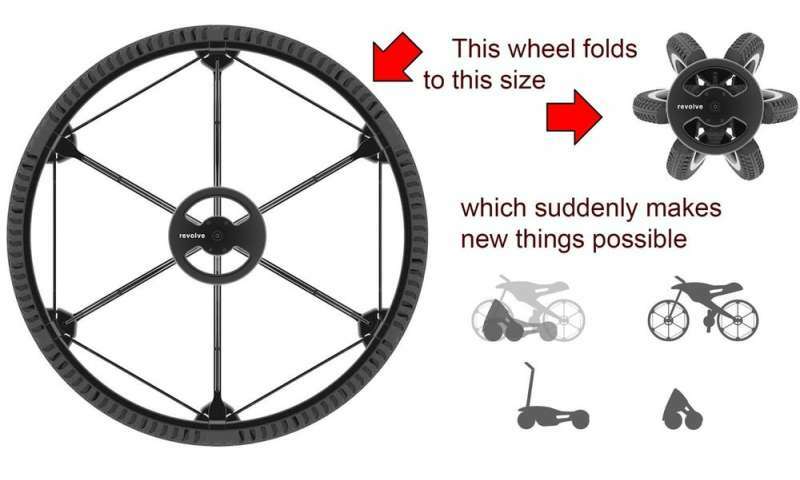 Wang had some design details of the wheel that can be collapsed: The wheel has a double hub, rim with rubberized sectors, and "spokes pivotly connecting each hub with the sectors of the rim." Wang said that spokes "are pivoted to the hubs substantially on the wheel axis and in the collapsed condition the sectors of the rim extend longitudinally between the two hubs." Mocellin told New Atlas that "The patented design was reached after several hundred 3D models and dozens of physical prototypes as I attempted to get the most accurate and efficient folding mechanism." There is a back story as to why designing a folding wheel captured his interest. Mocellin was a traveler, having lived in several cities in Europe, in Shanghai and in New York—having commuted on trains, roadways and bike paths—often on the go with a folding bicycle. "I have experienced so many folding bicycles with small wheels that are complicated and ugly when they are closed," he said in New Atlas. At the same time, though, the inventor's vision goes beyond bicycles and wheelchairs. Foldable vehicle? Cart? Land drone? Hand luggage? New Atlas quoted him saying "It was conceived as an enabling technology, and when folded, the side wheels that can be added as either traditional wheels or omnidirectional wheels are also designed to enable new ways of making better folding vehicles that can be used and transported in different ways." This full-sized wheel collapses to just 8 inches when folded, said Daily Mail. It looks like it can easily make your and other's pants dirty by accidentally touching muddy tires in crowded trains. Why is he carrying one heavy dirty wheel onto a train? Ddoes he have the rest of the unicycle in his pocket? A reasonably secured bike without wheels is much less likely to be selected for theft than a bike with them of which there are usually plenty available. With this invention I could just bring the folded wheels into my small studio apartment instead of the whole bike. Behold the foldable wheel that is SO AMAZING that it cannot be demonstrated! I'm impressed. @TheGhostofOtto1923 wrote: "Why is he carrying one heavy dirty wheel onto a train? Ddoes he have the rest of the unicycle in his pocket?" The obvious joke from that being "Is that a folded unicycle in your pocket or are you just glad to see me?" One possible answer to Ghost's question is that the train rules don't allow bikes at all or at the time he got there, so he parks a bike, removes the wheel so it won't appeal to thieves much, and takes the train to his destination or another place where he can use it on a different bike. It is very common for transit systems to have limited bike space and bans on bikes during peak periods. It's a stretch, but you could have a bike share running on a bring-your-own-wheel basis. Trollbane, I think you've hit on the only real use for this wheel when it comes to bikes. It's nice it folds up but a folding bicycle with 12, 16, or 20" wheels works just fine since they are normally designed to operate on the road. A 24 or 26" wheel really doesn't make much difference there. It's all in the gearing. The fact that is has to use basically solid rubber wheels won't make riding all that nice on two of them. I can see it being used for folding wheelchairs though. It would make getting those in and out of a car a bit easier. I have one and it's a p.i.a. to get it in and out of my wife's car. Seriously, why do we need folding wheels? It has never occurred to me that my wheels are too big and need folding so that they are smaller!
" A 24 or 26" wheel really doesn't make much difference there. It's all in the gearing." The larger diameter wheel is smoother running over cracks and bumps and up the curbside compared to the small wheel. It's less rattling to ride, especially in the city where you're constantly crossing roads that for some reason just can't be made level with the cycling path. Another reason for larger wheels is the efficiency. The contact patch is longer, so the tire and the ground deform less and the rolling friction is less. Eikka, read the article again. Those are solid rubber wheels! A 12,16, or 20" wheel with a tube is going to ride a lot better over sidewalks that those wheels ever will. Larger wheels are not any more efficient than small ones are and the longer contact patch adds friction not the other way around. Why do you think 'lycra' riders run 100+ psi in those little skinny tires? So the contact patch is as small as possible! Oh, and just to let you know, I can ride at 35 mph on my recumbent trike. It has 20" wheels. Like I said. It's the gearing and not the size of the wheel. "Those are solid rubber wheels!" They're airless, yes, but that doesn't mean they're hard. "and the longer contact patch adds friction not the other way around." That's not how friction works. Rolling friction comes from two effects: adhesion of the wheel to the surface, and deformation of the wheel which causes hysteresis heating. Adhesion in a bike tire is neglible, and the deformation depends on surface pressure which is the lower the bigger the wheel is.
" Why do you think 'lycra' riders run 100+ psi in those little skinny tires? So the contact patch is as small as possible!" No, that's to make the wheels as hard as possible, so they would deform less. The wheels are skinny to reduce air resistance, inertia and weight. Touring bikes for long distance easy cycling have wider wheels. As a thought experiment, what would happen if the same rider with the skinny 100 psi tires rode over sand? Why does a fatbike roll much easier in that situation?
" Oh, and just to let you know, I can ride at 35 mph on my recumbent trike. It has 20" wheels." It's not about going fast, but about having an easy comfortable ride. Small narrow wheels with high pressure tubes allow for faster accelerations, and they roll efficiently on hard smooth surfaces, but they're teeth-rattling to ride over paving stones and potholes. If you drop the pressure to get a more comfy ride, they don't roll well anymore and they become floppy and easy to bend out of shape. Larger wider wheels are harder to get up to speed, but they ride smoothly and roll easily without being pumped up to 100 psi, and they take abuse like bumping up a curb without instantly going pear-shaped. City biking is not about winning tour de france, it's about getting to where you're going comfortably, in style, without breaking a sweat. Cycling for sports in the city is a poor choice, because everyone's in your way and you become a danger to others.